Horses graze in the distance and ducks honk as Erik Andrus and I squish along the muddy path behind his house in Ferrisburgh, Vermont. Andrus’ dog, Dante, trots happily beside us. The scene is quintessentially pastoral. Yet surprisingly little grows here. When he bought the 110-acre property 10 years ago, Andrus, who also owns a bakery, tried to grow barley and wheat. The soils quickly proved too rocky and wet for these dryland crops. But Andrus was reluctant to call it quits. “Local grains are a key component of real agricultural sustainability,” he says. So in 2010, Andrus tried something unconventional in this frigid corner of the country: He planted rice. The hitch? Most rice strains are extremely sensitive to cold. But Andrus and other rice growers in the state (yes, there’s more than one) have been buoyed by the knowledge that cold-dwelling people in other parts of the world, such as Poland, northeastern China, and northern Japan, do successfully grow rice. Because northern Japan and Vermont both lie just above 40 degrees North latitude, Andrus’ plan to grow rice wasn’t all that farfetched. Moreover, Vermont has an abundance of one crucial resource: water. Most rice cultivars fall into one of two groups: japonica or indica. Whereas indica strains are typically longer and aromatic (think basmati and jasmine), japonica strains are short, sticky and good for sushi. Indica strains remain best suited for the tropics but some japonica strains can tolerate both cold temperatures and extreme variations in day length, such as long summer days, common to regions some distance from the equator. Rice growing in Vermont started with a farmer named Takeshi Akaogi, a Japanese native who used to grow rice in his home country before settling here 30 years ago. He, like Andrus, had large swaths of farmland that remained soggy year-round. So in 2006, Akaogi decided to give rice farming a go. Mia Murphy, Akaogi’s daughter and former organizer of the Ecological Rice Farming Conference, says the first year her parents tested seeds from northern California. That rice never came to seed. The following year, they planted the same seeds used by Japanese rice farmers and succeeded. Akaogi’s motivation for growing rice extended beyond finding a use for his marginal farmland. He also hoped that, when flooded, the rice paddies would support area wildlife much like natural wetlands. At least anecdotally, says Murphy, the number of dragonflies, frogs, and birds on the property increased. Akaogi further reasoned that the wetland paddies could prevent fertilizers used on nearby farms from entering local waterways, all the while giving his rice a nutrient boost. The Akaogis wanted to share their vision for rice growing in Vermont. So they started hosting the Ecological Rice Farming Conference on their farm in collaboration with rice researcher Susan McCouch of Cornell University. The Conference ran from 2009 until last year when the Akaogis retired from the rice-growing business. “All these growers from all over the Northeast came and were really excited,” Murphy says. 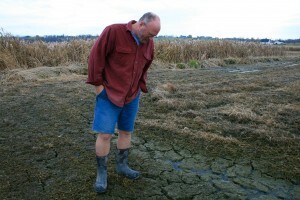 Over the years, a smattering of farmers and others around the state began planting rice. One of those early adopters was Sjon Welters, founder of Rhapsody Natural Foods, a food processor for organic fermented products in Cabot, Vermont. 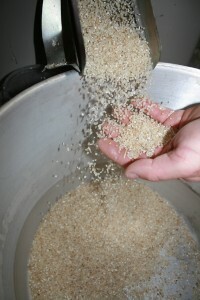 Welters acquired 30 rice seeds seven years ago and gave rice-growing a test run. That small project proved so successful that Welters began gradually upping his seed count. At his highest point, he successfully planted three 1,000 square foot paddies with 3,000 seeds apiece and produced about 150 pounds of rice. He suspects he could get twice that amount with optimal weather conditions – more than enough to feed the three families living on his homestead. Welters has had some struggles, though. Cabot is located in northern Vermont and Welters’ farm is at 1,300 feet elevation, putting his rice at the every edge of its natural growing range. “Last year, our crop failed because we got an early hard frost,” Welters says. Back at Andrus’ farm, we loop back to his house, a yellow colonial that towers over the otherwise flat landscape, and kick off our muddy boots. Turning his farmland into rice paddies took some work, Andrus says. First, with the help of engineers, he drafted a hydrology model of his land, so that he could easily move water around. For instance, he built his reservoirs uphill so that the water could cascade down via gravity, rather than an external energy source, when he needed to flood the paddies. The high water in rice paddies, Andrus explains, helps control weeds. Andrus also practices a form of rice farming known as duck-rice farming that utilizes both water and hungry ducklings to keep weeds at bay. Harvesting time rolls around in October, and by November the rice stalks are cut and Andrus is almost done processing the rice. While other farmers in the region are content planting an acre or less of rice, Andrus is working to scale up. “I’m really trying to make a living selling rice,” he says. This year, Andrus produced 3,000 pounds of rice on 1.3 acres of land. 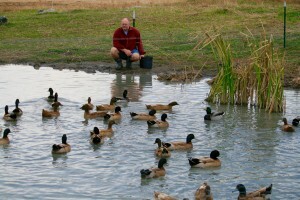 But duck-rice farmers in Japan can produce up to 3,500 pounds on the same size plot, so Andrus knows he can do better. Besides improving yields on the existing rice paddies, Andrus hopes to eventually increase production to five acres. This work by Sujata Gupta and the Johns Hopkins Center for a Livable Future is licensed under a Creative Commons Attribution-NonCommercial-ShareAlike 4.0 International License. Based on work at www.livablefutureblog.com. Images in this post are not included in the Creative Commons license. Sujata Gupta, a freelance journalist based in Burlington, Vermont, has written for a number of publications online and in print, including The New Yorker, Discover, Nature, NPR and others. Follow her on Twitter @sujatagupta or check out her work at www.sujatagupta.com.